One of the many problems facing commercial brewers today is the inefficiency in lager brewing. Another problem is that the fermentation process produces unwanted byproducts. Genetic modification of yeast may just have the solution for these problems. A recent research shows that fermentation of beer carried out using genetically engineered brewer’s yeast may lead to more efficient lager brewing. It also shows that GM yeast may result in a lower environmental footprint. The study was conducted by researchers from the VTT Technical Research Center of Finland. Using more concentrated, high gravity, and very high gravity brewer’s worts for beer manufacturing has environmental and economic benefits. By adding more sugar and using a particular strain of brewer’s yeast, brewers can produce a beer that has a higher alcohol content using the same quantity of ingredients. Commercial brewers can dilute the resulting concentrated beer with water to produce a beer that contains the desired alcohol percentage. However, existing strains of brewer’s yeasts ferment very high gravity brewer’s worts incompletely and slowly. This leaves unwanted byproducts (such as maltose and maltotriose) in the resulting beers. Current research supposes that lager yeast strains have a faulty gene considered to be causing the brewing problems. 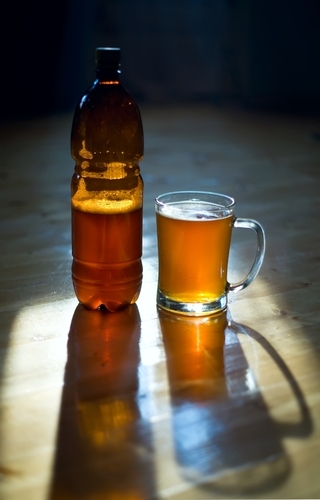 The researchers repaired the yeast’s genes with the help of DNA sequenced from an ale strain. They found that the new yeast fermented very high gravity lager wort more completely and faster than unaltered strains. This produced beers that contain more ethanol and less undesirable byproducts. According to the researcher, "They [the transformed yeasts] fermented VHG wort faster and more completely, producing beers containing more ethanol and less residual maltose and maltotriose." The study was conducted by Virve Vidgren, Anne Huuskonen, Hannele Virtanen, Laura Ruohonen, and John Londesborough. Their study appeared in the Applied and Environmental Microbiology journal.